This module provides information on flooding associated with river ice jams. Based on a presentation by Dr. Kate White, a nationally-recognized expert on river ice, this webcast explores basic river ice processes including the formation, growth, breakup, and transport of river ice and how it can become jammed, triggering floods. This shorter version of the previously published module "River Ice Processes", has less focus on the US National Weather Service, making it more broadly applicable, including to an international audience. One of the best online lessons I've had. A very informative and well-designed module. May be best for advanced high school and above. Excellent subject.very interesting.But the online module is not running after 6th slide.read through print version. Excellent Module. The concepts are explained in simple steps. Describe factors leading to flash floods due to ice jams. Use standard language to describe ice jams. Describe basic ice processes including: formation, growth, breakup, and transport. Explain why ice jams form. 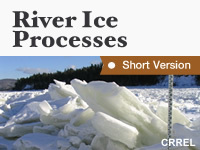 Describe the different types of river ice and their impact on river ice jam formation. Describe the different modes of breakup and their impact on river ice jam formation.